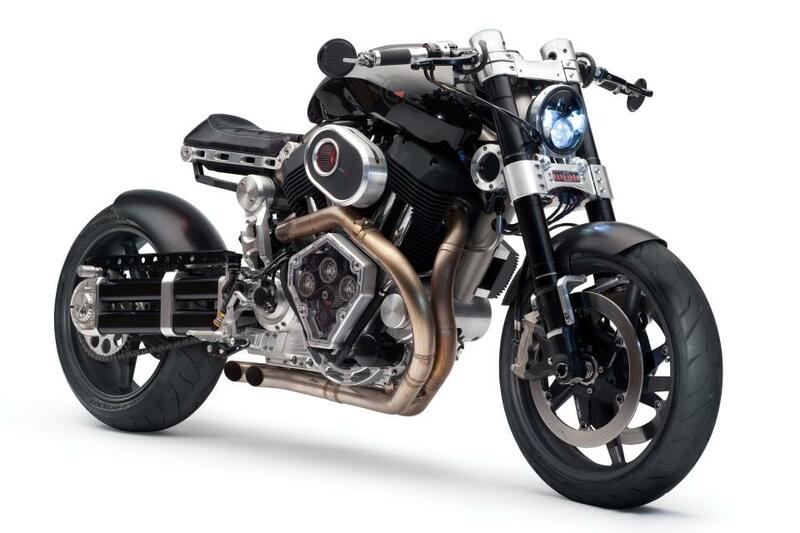 This is the X132 Hellcat from Confederate. It radiates Badass like it’s the Chernobyl of Badassery. Even the name is badass. Let’s talk about the name for a sec… It’s very fitting. In WWII at the start of the Pacific Theatre Conflict, the US Navy had a lot of fighters called the Wildcat. The Jap Zeroes had little problem knocking them out of the sky as the Zeeks were faster, more agile, and just gave us hell. So the US Navy decided to give them hell. They came out with the Hellcat and it was all about brutality. More powerful engines and weapons and all the sudden the table was turned. It was an overpowered, overgunned fighter that claimed 5271 enemy fighters – more than any other allied aircraft. Now take a look at this motorcycle and tell me it’s not worthy of that name! 2163 CC’s of Muscle giving the Hellcat 132 Horsepower and an asskicking 150 pounds of torque. That’s a ridiculous amount of power in such a little bike. It’s heavy, 500 pounds, but that weight is all engine. This bike is a wicked cross between a Bobber and a Cafe Racer. The Hellcat is no chopped and beefed up Harley. Don’t let the V-Twin engine fool you. This bike is engineered from the ground up to be exactly what it is… a brutal force of nature that has no mercy for it’s enemies… Everything on the bike is designed specifically for it’s purpose. This is Engineering from the school of the Ends Justify The Means. The Cafe Racer style is my favorite kind of motorcycle. It’s stripped down, purpose driven, lean, and angry. And then there is Confederate Motorcycle’s take on the Cafe Racer concept… I think the early planning stages had a discussion over what bike this would end up being. And then to illustrate what the bike needed more off, the large brute smashed the board room table into splinters with his fists, and then ate it. And that’s how the Hellcat was born… through malice and furious rage. This is bike isn’t in a Biker’s Dream… This bike is in a Biker’s Nightmares – this is coming after them – and they can’t get away from it no matter what they do. The hellcat is coming for them. This is the bike that Death himself rides, this is Mortis. And Hell follows it. Ummm… I think that may 2163 CC’s. 😀 2163 CI is probably the volume of the whole bike itself! I do love that bike – it’s gorgeous, but I’d probably kill myself on it. I have too little self control when it comes to speed. The GF wants me to get a bike, but I’m leaning toward a t-bucket street rod. Close to the same wind blowing in your face effect, no helmet/gear needed and 2 more wheels. Ahhh… Heaven! Helmet and Gear are ALWAYS needed on a Bike, or these new Trikes that are getting popular. An Old Classic Rod like your thinking – Very cool… No gear needed… but that’s a whole other topic! I think if JMB had designed motorcycles instead of guns he might have come up with something like this. It reminds me of the Ma Deuce only with wheels. The Wildcat wasn’t a pushover. The F8F Bearcat was a true beast. Way cool Bike! As a fellow biker, I’ve never seen or even heard of these…I’m digging your new Bike of the week deal. Ride safe and glad ur ok from that spill recently. Holy Cow! $50,000 bones…and I thought my Harley was expensive…but even still, the Hellcat is one badass bike. I bet a clever lad with an abundance of cash could find another 60 HP in there.